Just steps from the water`s edge! Eagles Perch offers a 10% discount to all Veterans, Active Duty Military, Reservist, National Guard Members, Coast Guard, Law Enforcement, Fire Fighters, Red Cross Workers, Ambulance Drivers, First Responders and Educators. 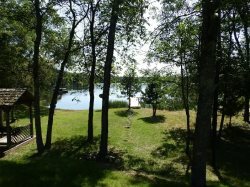 Ideal for groups needing lots of room to relax, this year-round two bedroom, two bath cabin has a great lake view with an expansive, wrap around deck right on the shoreline of Eagles Nest #1. This home also features a large patio off the lower level. With a living room upstairs and family room downstairs it is perfect for parties with different age groups who want their own space to kick back and relax after a day on the water. 2 Bedrooms: Upper level has master bedroom with queen bed and second bedroom with twin bunks plus additional twin bed. Bed linens provided. 2 Bathrooms: Upper level bath with full-sized tub; second bath on lower level with shower. Toilet paper provided; bring your own bath/beach towels and toiletries. Well stocked kitchen on lower level includes refrigerator, stove/oven, microwave, and small electric appliances. Dish washing soap, garbage bags, kitchen towels and pot holders provided. Walk-out to a sheltered patio with propane grill and patio furniture. Paddle boat, canoe and rowboat included. 15 miles from Ely Eagles Nest #1, located mid-way between Tower and Ely, offers fisherman a wide variety of fishing and recreational opportunities. The Lake is connected by a 75’ channel to Eagles Nest #2 and, combined, equals nearly 750 acres of fish-able water with no motor restrictions. The lake is known for having great numbers of smallmouth bass, walleye, northern pike, perch, bluegills, and crappies. All cabins rent Saturday to Saturday and are available by the week only. If you are looking for a stay longer than a week, or need a check in on a different day, please contact our office to book your stay. Please be sure you have selected a Saturday check in before booking online. Rates are based on 5 guests. Additional guests are $105/week per person. Pre-school children under 5 years old are free.